Grillmats are interesting and popular barbecue utensils, but being what they are, they don’t offer a wide range of features. That doesn’t leave a lot of material to draw from for a BBQ grill mat review. For that reason, when reviewing them I like to focus on just two main aspects of the product: the specifications, and a comparison between what is advertised and what is delivered. So let’s jump right in to this Yoshi Grill Mat Review. 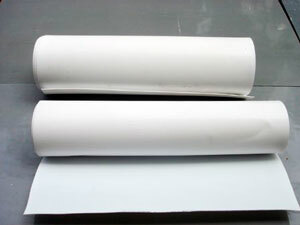 Basically, you have a PTFE sheet, or more accurately, a fiberglass fabric, with varying amounts of PTFE coating. 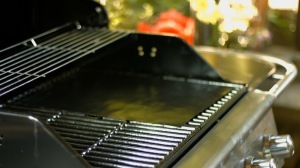 Grilling mats can differ in size, thickness and amount of nonstick material, but beyond that the differences fall into the category of expectation, and that has to do with the claims made by the manufacturer. In other words, did you get what you were expecting when you purchased it – or, in the case of a shopper, will you get what you’re expecting. 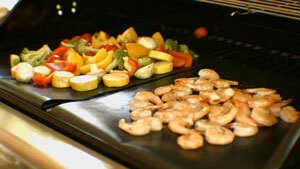 The Yoshi was a very popular grill mat “As Seen on TV,” and that’s where its sales momentum continues to come from. People who are familiar with it from its television appearances assume a high level of quality when in some ways the opposite is the case. The Yoshi Grill Mat measures 13 x 15 inches, is around .14 mm thick and has what I would call a medium amount of PTFE coating. As an aside, you can compare the PTFE fabric from one grill mat to another by doing a visual and/or tactile inspection: when there is more PTFE material applied in the manufacturing process, the underlying texture of the fiberglass fabric is less visible and less noticeable to touch. Conversely, when the nonstick coating is lightly applied, the fiberglass texture is more pronounced. Generally, the more nonstick surfacing on a mat, the better the mat will perform and the longer it will last. This generalization is mitigated by the rather significant additional expense involved in adding more PTFE coating in the manufacturing process. …its just too small in my opinion. 13 x 15 can only hold a small amount of burgers and meat, and as many of the other reviewers here have stated, if you’re grilling something fatty like hamburger or sausage, you will be swimming in grease in no time. It just builds up and then rolls off the edge making flame ups and a hot mess. By way of explanation, the Yoshi mat was an original As-Seen-On-TV grill mat. I bring this up because those infomercial grilling mats are clearly at a disadvantage where refined and updated features are concerned. They were the first on the market, and as such they lay the groundwork for the improvements that were subsequently made by other brands and manufacturers. In many ways they have become obsolete products for that reason alone and the small size is just a single clear example of that. I give the Yoshi Grill Mat bonus points for its thickness specification. It is a bit thicker and more durable than the original Miracle Grill Mat, and that was one of the weaknesses of those early designs. 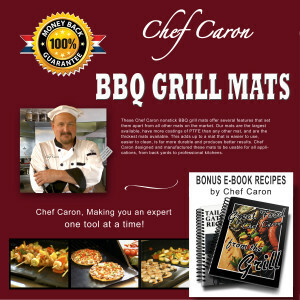 When the first infomercial-based grilling-mats hit the market, the big selling point was that they produced the familiar barbeque grill-marks on the food, which have always been a signature of grilling food. One can imagine the fear of the original marketers of the BBQ grill mat. “We’ve got to make sure the food still has grill marks on it. Nobody’s going to buy these if you can’t see the grill marks.” Obviously, I made that up, but can’t you just hear them saying it? They accomplished grill-markings by making the mats thin enough so that the grates transmitted more heat to the surface of the mat than the area around them, creating clear grill marks on the food, but often burning holes in the grill mats in the process. Here’s another excerpt from a verified Yoshi Grill Mat Review on Amazon, written by John Thomas, a Top 100 Reviewer. Also, although it states in the commercial that you get the flame lines on the meat, I have yet to see that happen. You would have to leave it for a very long time and char whatever it is you’re cooking. The problem here isn’t that the Yoshi Grill Mat doesn’t leave grill marks. The problem is with the expectation of the customer (which was not met) and the fault lies with Yoshi for not clarifying what a grill mat can and can’t do. It’s one thing for the Yoshi Grill Mat to be able to leave grill marks on a pancake (which they do), but something far different to leave marks on a steak when people are used to getting that almost instantly on an overheated grill. Keep in mind, all grill mats have to be used below 500 degrees Fahrenheit which rules out cooking meat the way people are used to doing it on the barbecue. 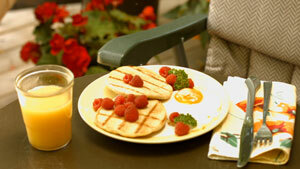 Grill mats perform in a stellar fashion in many areas, but putting grill marks on meat isn’t one of them. They are fantastic for grilling food that normally sticks to the grill, like most types of fish. And they are also great for cut vegetables, things like asparagus that would fall through, breakfast foods like hashbrowns, bacon, pancakes, eggs and just about anything else you can imagine. The last issue to address is the amount of PTFE material. The Yoshi Grill Mat Review gets an above average grade for that. It’s not the slickest mat available, but it has a sufficient amount of PTFE coating to give it above average durability and an ease of use and cleanup that is better than most of the grilling mats on the market. Most grilling mats come in a set of two, with the occasional set of three. 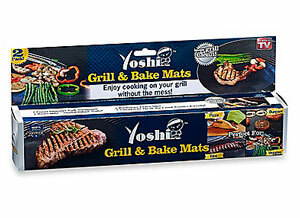 Yoshi provides one grill mat and one baking mat in the same box. That’s a little unusual, and I like unusual. However, the grill mat and the baking mat are exactly the same, except one is brown and one is black. 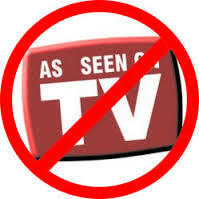 They are interchangeable as far as function is concerned. You can use a grill mat to bake with and vice versa. So it’s not really an important consideration. I noticed in reading the Amazon reviews that it actually confuses some people. For example, here’s a quote from another verified Yoshi Grill Mat Review on Amazon. The phrase “BBQ Mats” is incorrect. There is one BBQ mat and one BAKE mat. NOT TWO BBQ MATS, like I thought I was buying. So again, there’s an example of customer expectations not being met. A simple clarification on the packaging would have cleared that up, but there isn’t anything like that, which is a consistent problem with the Yoshi Grill Mat. Review after review on amazon will attest to that. I would recommend looking elsewhere for your BBQ grill mat purchase. There are better mats on the market now that meet what I consider to be the needed specifications. 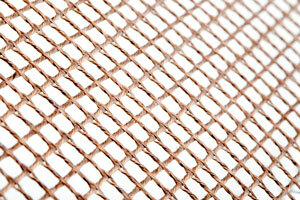 Look for a grilling mat that is 13 x 17 inches in size, .20mm thick, and offers the extra layers of PTFE material. If you get all that, you’ll be getting the best mat available on the market.